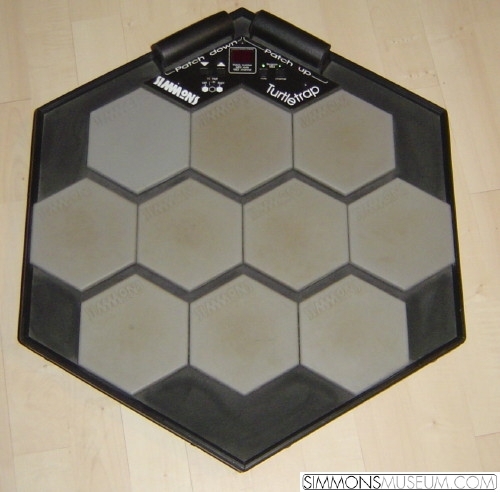 The Turtle Trap is one of the last Simmons products ever produced in series, built in 1994. It is a multi pad midi controller comprising 10 trigger zones as well as 7 jacks for external pad connection. A HiHat controller can be plugged as well. Each trigger can be assigned to a midi note and these assignments can be organized and stored in up to 60 patches. The Turtle Trap can eather be mounted on a Pearl compatible tom arm or just be used as a desktop device standing on 4 rubber feet.